Can I use this for the supply of the Zkit1...? 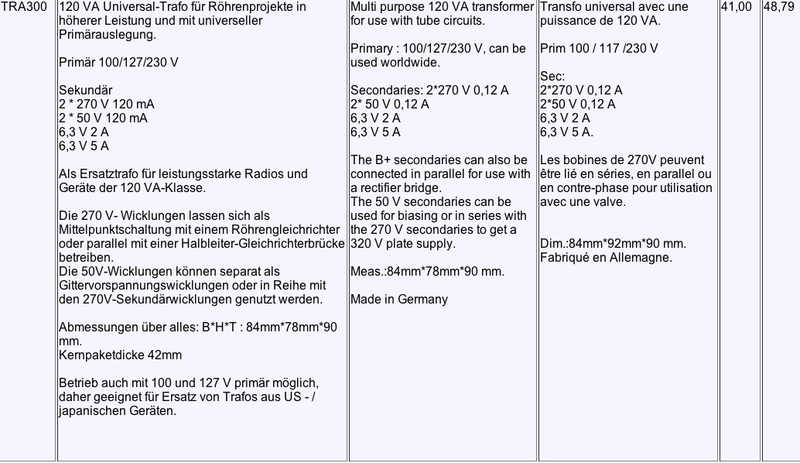 1 and 8 are the incoming 240V prim. 9 and 10/270V and 11 and 12/270V sec. Using the secondaries in parallel to get 240mA would lower the voltage out of the rectifier diodes quite a bit. I'm not sure the series resistor value can be lowered enough to safely bump up the voltage near Steve's measurements. And you say doing this eliminates using the CT? It appears you can get 320V by connecting a 50V secondary in series with a 270V secondary. That would get you a high enough voltage out of the 2 x diode rectifier on the board that no modification of the series power resistors would be necessary. Or you could lower that value resistor a bit to up the voltage if you wanted. I'm afraid I don't know if the 120mA using a single secondary is enough but I suspect it is. The heater secondary appears to have plenty of current.